On Tuesday night, Scooter Gennett became the 17th Player in MLB history to hit four home runs in a game. This begs the question, what is the most difficult single-game achievement in sports? In 2012 Sam Gagner managed to throw up an 8 point game with Edmonton (4 goals, 4 assists). But before him, the most recent 8 point game was Mario Lemieux in 1988. Guys just don’t score 8 points in a game anymore. Goalie equipment is bigger, opposing players are bigger and faster, teams are more structured and system-oriented. There have been 13 eight point games in NHL history. There have been no nine point games. Sittler stands alone with 10. Long live Dirty Darryl. BB: Haha “whomp”, what a great word…I miss Disney’s Recess. Auston Matthews is to Hockey as Vince LaSalle is to Kickball. Some teams can’t even score 100 in a game, but to do it on your own seems crazy. The closest anyone has come to this record is Kobe with 81, but a 19 point difference is still a lot. This record has stood for 55 years and honestly I don’t see anyone topping that anytime soon. “Hard hittin’, Mark Whiten”. This guy doesn’t hold just one all-time record from this game, he’s got two. The 4-HR game has only been done 17 times, as previously mentioned. But with those 12 RBIs, Whiten also sits at the top with just Jim Bottomley (Sept. 16th, 1924) up there to join him. Whiten hit a Grand-Slam, two 3-run home runs and a 2-run shot to make this happen. Getting those opportunities to cash in runs alone is an unlikely circumstance, which makes it that much more impressive he was able to capitalize on it. Lebron James is rumoured to move a Western Conference team in 2018 free agency. Where do you want to see him go? Lebron already owns a house in LA where he spends a lot of his offseason. Let’s say he takes his boys on a cruise this summer and floats the idea of bringing the band together on the west coast. Chris Paul re-signs with the Clips this summer and Lebron joins him a season later via free agency. There’s half of the “Banana Boat Crew” right there. Dwyane Wade could opt out of his contract with the Bulls this summer, or he could opt in and hit free agency a year later with Bron Bron. The biggest obstacle will be trading for Carmelo. If the Clippers are willing to pay his hefty salary and give up some talent in return–Melo for Griffin sign-and-trade?–then something can be worked out. Being the only one with guaranteed money beyond 2017-18, Melo would probably have the highest salary on the team. I think it might be hard to get Wade, Paul and Lebron to ALL take a haircut for the sake of making sure that the Clips can get that Melo vibe. I wouldn’t take a back seat to that clown, salary or otherwise. There’s a lot of reasons this wouldn’t work–age, contracts, egos, the ability to build a competent team around the four–but it’s still a cool idea. We’ve been through this once already, and it was pretty ugly the first time. LeBron leaving Cleveland for Miami caused the entire state of Ohio to turn against one of the best basketball players ever… but if that were to happen again? I don’t care if he finally brought a major championship to Cleveland, if LeBron goes anywhere it will cause a riot that’ll look very similar to Vancouver 2011. But seriously, just stay LeBron. If you can’t beat Golden State now, what makes you think you can beat them throughout more regular season matchups and then having to face them earlier in the playoffs? Do the smart thing. Stay in Cleveland and continue to dominate the weak Eastern Conference. And if you really want to bring legacy into this, winning another trophy with Cleveland will help you out a lot more than ring chasing will. Not much more needs to be said other than why the hell not at this point? OBJ has been skipping OTAs in protest as he holds out for a new contract from the Giants. What contract holdouts jump out in your mind? This was a huge miscalculation from the former Senators captain. He wanted out of Ottawa and the Senators called his bluff. Yashin sat out the entirety of the 1999-2000 season feeling that he could wait out the last year of his contract and then walk in free agency. The league ruled that Yashin still owed the Senators another season of play and he wasn’t granted his free agency for the 2000 offseason. After this colossal misfire, Yashin was forced to deal with the Senators on their terms. He was promptly shipped to the New York Islanders in one of the most lopsided deals in NHL history for Zdeno Chara and a first rounder used to draft Jason Spezza. S/O Professor Hyatt and SPMA 2P00 at Brock…I don’t mean to go all history lesson on everyone, but this is the holdout of all holdouts. Andy Messersmith and Dave McNally were both MLB pitchers in the 1970’s and are the main reason (along with the genius of Marvin Miller) that free agency came to be in professional sports as it is today. At that point in time, MLB contracts operated under the power of the “Reserve Clause”. What this meant was that when a player signed a contract with a team, upon the expiration of the contract, the team had the right to the player for the next full season. Players then couldn’t sign elsewhere, and their salaries were in-turn forced as low as teams pleased because there were no other offers for the players to consider. Executive Director of the MLBPA, Marvin Miller, came up with the brilliant idea for Messersmith and McNally to holdout from signing a new contract after it expired and then play the next full season while not under contract. The idea was that since they were not under contract and still played a full season, this satisfied the year of the Reserve Clause attached to the back end of their contracts. This went to arbitration upon season’s end and Messersmith and McNally came out on top over the owners and they were then deemed free agents. This opened the floodgates for all other MLB players to do the same as Messersmith and McNally with their contracts and baseball free agency became the norm following the abolishment of the reserve clause. I’d say that’s pretty notable stuff. This is probably the most memorable holdout in NHL history. Eric Lindros was a #1 overall pick in the 1991 NHL draft and basically told the Nordiques that he was too good to play for them. Instead of making the jump to the pros, Lindros decided to spend that season playing for the Oshawa Generals of the OHL and Canadian National Team. When Quebec eventually did trade his rights at the 1992 Draft they had somehow managed to mess this up and make deals with both the Rangers and Flyers. It was ruled that the Flyers deal would be the one upheld. In return, the Nordiques got Peter Forsberg, Mike Ricci, Ron Hextall, Steve Duchesne, Kerry Huffman and a first-round pick (Jocelyn Thibault). These players went on to help the recently relocated Colorado Avalanche win a Stanley Cup in 1996. Not a bad return for a guy who had never played an NHL game before. Is Lebron’s season over tonight? Tonight is definitely “more than a game”. It’s been a pretty good week for Ronaldo. It began with scoring 2 goals for Real Madrid in the Champions League final to help his team to their second consecutive Champions League trophy. With this performance he became the first player to score in three Champions League finals and Real Madrid became the first team to win back-to-back in the Champions League era. Then just a few days later, he was announced as the cover athlete for FIFA 18, adding more to the long list of achievements for the superstar this season. KD is absolutely having his way with the Cavs through the first three games of this series and has clearly emerged as the leader of the Warriors. He’s contributing across the board, with per-game averages of 30 points, 10 rebounds, 6 assists, 1.3 steals and 2 blocks. He may have taken what many would consider the “easy” route to a championship, but he’s clearly proving he’s not just some passenger on this potential 16-0 playoff ride. The Calgary Flames definitely need a new arena. But having your President of Hockey Operations say that the team will leave Calgary without the city ponying up is not the best way to handle the situation. The Saddledome is now the oldest arena in the NHL having been built in 1983 (I know MSG is older, but just had a billion dollar renovation completed in 2013 so it’s much more modern). Now, the Flames’ President, Ken King, has been doing some damage control trying to backtrack on what Burke has said. Threatening to relocate whenever you don’t get your way is not the way to manage an organization if you want to keep your fans (@Raiders @Chargers @Rams @Any team that threatens to relocate when they don’t get their way). Tristan Thompson has been outrebounded by Stephen Curry in this series. Hate to rip on a Canadian NBA player, but Thompson has been worse than awful in this series. He’s known for providing energy, good defence, grabbing rebounds and creating second chances for his team. But he’s done none of that against the Warriors in the Finals. Thompson had a good regular season, and has been a key postseason contributor to this point. But on the biggest stage, he’s only managed to muster 2.7 points and 3.7 rebounds per game. Yikes. Over the years I’ve been a Crosby apologist. I could never get on the “Crysbaby” wagon and I used to think that he was only criticized so much because the spotlight was on him more than some of the other d-bags in the league. But what the hell was that stuff last night? The Penguins won the game 6-0 and Crosby had three assists. Despite this I thought last night Crosby was the real loser. I don’t care if Subban doesn’t use Listerine, the type of aggression shown in bashing PK’s face off the ice repeatedly is only justifiable when someone abducts Liam Neeson’s daughter. When you’re the “face of concussions” like Crosby but then pull crap like that, it’s tough to remain a sympathetic character. The water bottle stunt strikes a personal chord with me. In grade 6 I was in a 100 meter dash heat with four of the fastest kids in the class. I was feeling confident, the legs were fresh and I was ready to shock the world. 50 meters in I was having the race of my life. And then at three quarter mark, with a surprisingly healthy lead, my day was ruined when some kid in Grade 3 threw his water bottle on the track. We had to restart the race and I finished last. Don’t be that water bottle throwing twerp Sid. Shoutouts to: Karl “The Mailman” Malone, Jose “Joey Bats” Bautista and, Jerome “The Bus” Bettis, who I couldn’t find room. If your nickname is so good that it essentially becomes your first name it’s self explanatory from there as to why it’s the best. It just sounds right. Johnson was “Magic” on the court and that will stick with him forever. CB: Just wondering how “The Great One” doesn’t make this list when it’s easily the most recognizable nickname in hockey. Show some love to #99. BB: While Gretzky is the GOAT, I’ve got to say his nickname is kind of boring…as recognizable as it may be. 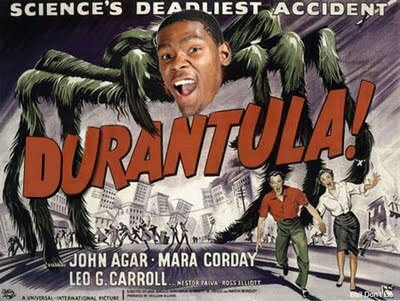 Kevin “Durantula”, “K-Smoove”, “Kid Clutch”, “The Baddest”, “The Servant”, “Mr. Tickle”, “The Rim Reaper”, “Slim Reaper”, “Iceberg Slim” Durant should get a little shoutout. Also a quick Wikipedia search of Matthew Dellavedova unearthed some gems: “Delly”, “The Wonder from Down-Under”, “Outback Jesus”, “D and 3”, “Delly Trey”, “HellavuaHustle”, “The Janitor”, “Dellavediva”. I always liked Roy “Doc” Halladay (my favourite baseball player of all time) who got the name from broadcast legend Tom Cheek in reference to Wild West Gunslinger “Doc” Holliday.